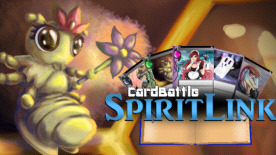 Card Battle Spirit Link is a digital card game that uses a revolutionary Spell Book system! Instead of traditional decks, players place their cards in a Spell Book where each card is one page of the book. At the start of each turn, players turn a page making the next 2 cards ready to play. Card Battle Spirit Link has no micro-transactions and no card packs. 14 Leader cards with unique effects! On planet Ceres, peace had not been known for centuries. The many Nations of sentient beings had been at war for almost as long as anyone could remember. The countless conflicts and clashes of weapons and spells of mass destruction threatened to tear the very planet apart. Therefore, the planetary council of magic intervened. The representatives from every nation joined forces to cast a powerful and terrible spell on the entire world. From then forth, all wars, and the fate of the planet itself, became connected to Card Battles carried out on another world. This other world, is Earth. In order to resolve conflicts on Ceres, Leaders must seek out their other self on Earth and join forces with them in Card Battles. Go Now! Find your other self, form a Spirit Link, and claim victory! This is Card Battle Spirit Link!